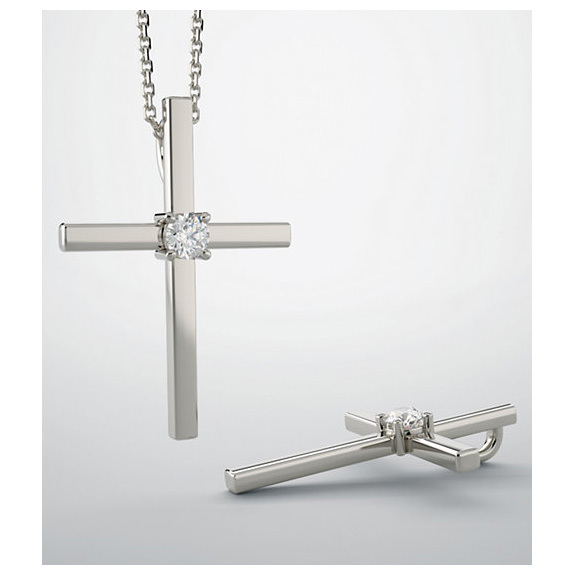 A 0.15 carat solitaire diamond is set in this 14k white gold diamond cross necklace, from Apples of Gold Jewelry. The center diamond symbolically represents the cleansing power of the blood of Jesus Christ, who died for our sins, was buried, and rose again on the third day. The cross pendant measures just over 1" tall x 3/4" wide. The center solitaire diamond is a G-H Color, I1 Clarity white diamond. The chain is sold separately. Purchase our 1.4mm 14k white gold cable link chain in 16" - 24" to match (optional). We guarantee our He Died for My Sins Diamond Cross Necklace, 14K White Gold to be high quality, authentic jewelry, as described above.